Our last day here was a little lazy. Since we were in no rush to go any where we made it a relaxing time with the kitties. Ever since we have been here the it has been quite windy, One day it is 80 degrees, the next 50. Crazy weather. Even though we brought long and short sleeve clothes we had to do laundry often because we were always out of one or the other. After doing laundry we decided yo take a drive around to a couple of the other towns. 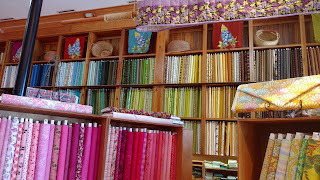 We decided to check out a couple of the other quilt shops on the hop hop, just for fun. 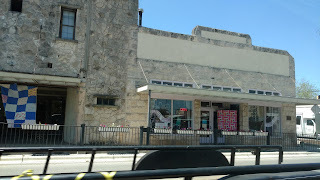 Our first stop was Boerne, (I think pronounced Bernie)/ The town was another Texas town with German influence and it was a pretty good size. 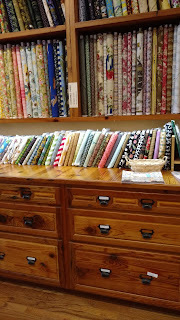 The quilt shop, Sew It Fabulous has recently moved into an industrial area and we had a heck of a time finding it. We thought for sure we had the wrong address or the GPS was sending us the wrong way. We found the shop tucked away in the back corner of the building. The people in the shop were very nice and friendly. I did find some thimbles that I had been looking for. I can't seen to keep a thimble on my fingers, because they don't fit snugly over my finger joints and fall off when I start stitching. These thimbles were more grippy and rubbery and actually snug to my finger, so hopefully I'll be able to use them when doing my applique. 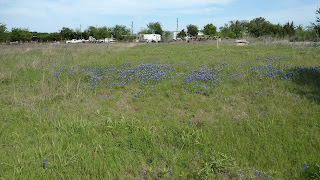 I found some blue Bonnet fabric to go with my Texas Wildflower layer cake. 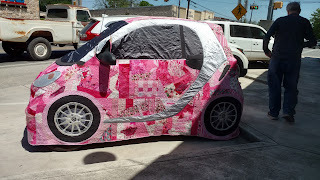 Next we drove to Blanco, Tx to visit Uptowb Blanco Textile Studio. This was one of the most unique quilt shops and buildings I have ever visited. 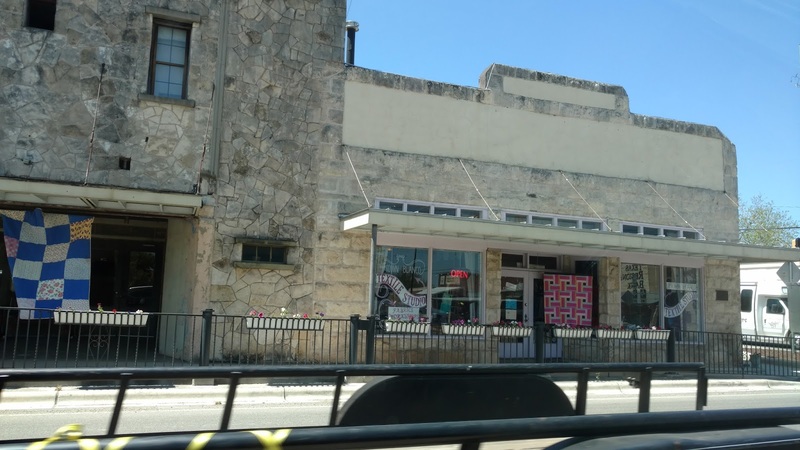 The shop was in an old mercantile store in downtown Blanco. 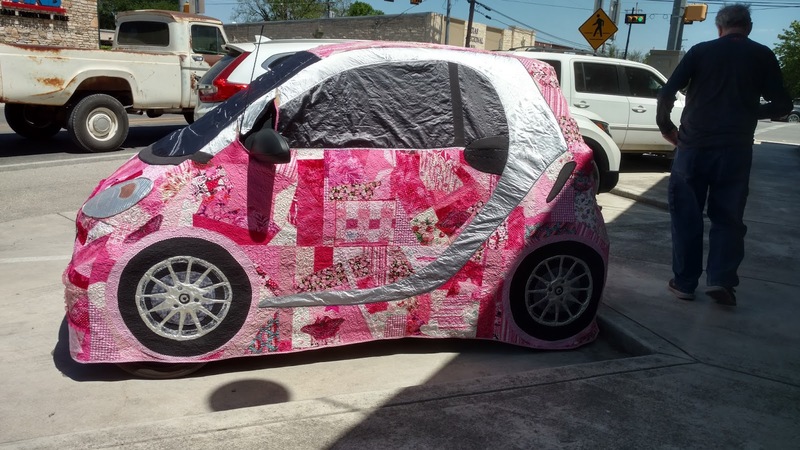 We parked around on the side street and this was parked there also, Someone had made a quilt cover for their Smart Car. Very funny. Inside, this shop was so incredible. They had tons of fabric all arranged by color, but the shelving and woodwork was so beautiful. One of the people that worked there told us they had used the original flooring to make the cabinets, counters and shelves that went to the ceiling. They had a library ladder to climb up to get the bolts from the top shelves. The back of the shelves was bead board. 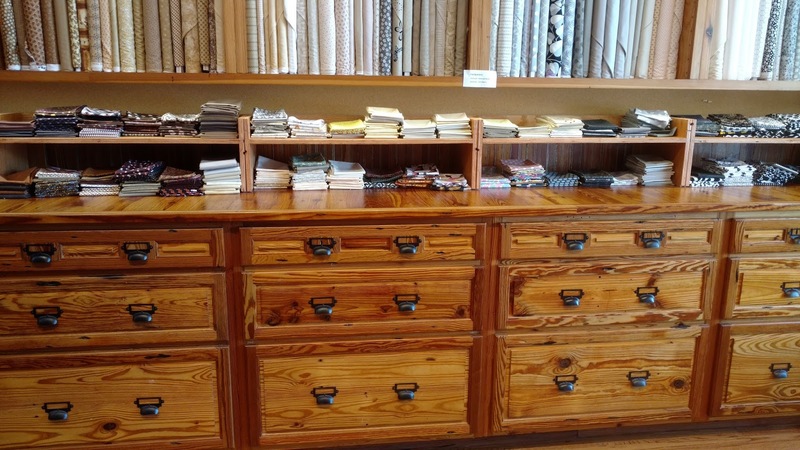 The wood was so beautiful you were so busy looking at it that you couldn't notice the fabric. It was a great stop, but I didn't see any fabric I couldn't live without. We were getting hungry so we stopped across the street for a hamburger at The Redbud Cafe. This place was busy with locals and it was a good size place. Evidently on weekends they had live music. Their menu was mostly salads, soup, sandwiches, but the also had a bar that served wine and beer. We didn't try it, but the hamburgers we had were excellent---very fresh and cooked just right. 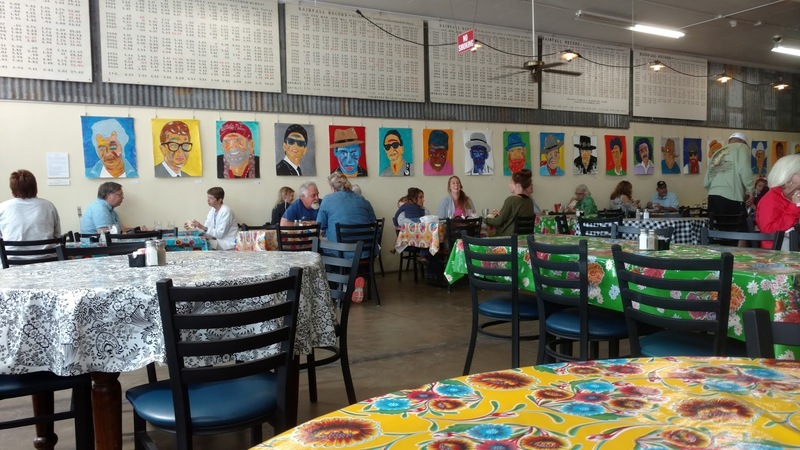 It was an odd cafe with brightly colored oilcloths on the table and someones original artwork of country artists on the walls. 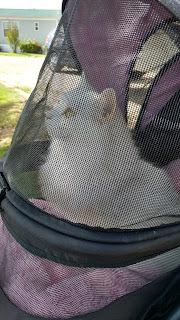 Back to Frederickburg we went to spend more time with the kitties and take Bentley for a walk in his stroller. 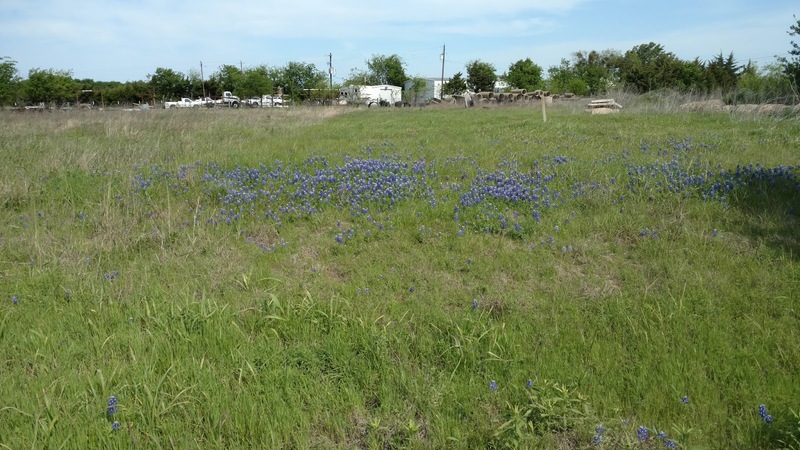 I did get a few pictures of Blue Bonnets, but they were rather disappointing. We thought we would see more fields of them and they looked like little tiny miniature lupines (which they are). 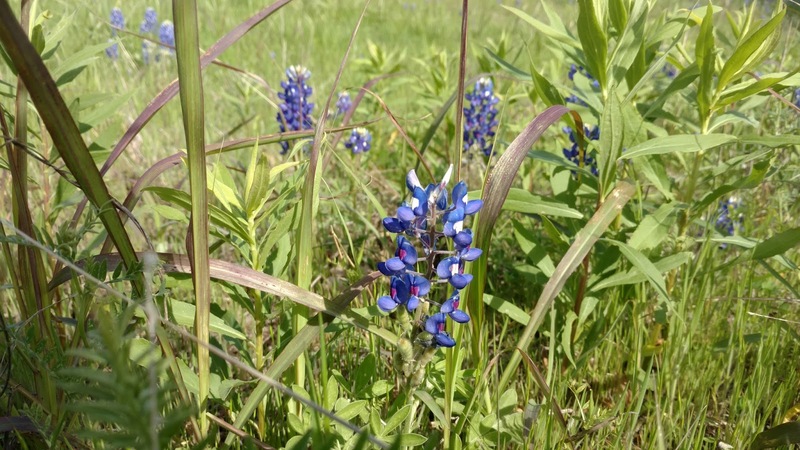 They are not nearly as impressive as real Maine lupines. I'll never forget the picture we took of Glynda standing in a huge field of lupines in Maine.